WhatsApp's hidden disruption - driving pseudo-"number portability"
I haven't done a full post about Facebook acquiring WhatsApp - there's been 100's from other places and mine would be lost in the noise. I expect that we'll hear a lot more in coming months anyway, given the CEO Jan Koum's announcement at MWC that it will be adding some form of voice communications in Q2'2014. (Interestingly, Facebook has been ramping up its own embedded VoIP feature in its Messenger app recently, as well). Obviously I'm curious as to whether we'll see something WebRTC-like from either company as well. My suspicion is that it will be proprietary for now, but perhaps use certain aspects of WebRTC-like behaviour, perhaps in terms of the codecs or firewall/NAT-traversal. We will probably also see a PC-based browser endpoint for WhatsApp using WebRTC before the mobile app. But that is separate to my thoughts for this post. I'm wondering whether WhatsApp has another important role to play, which may also prove to be a game-changer for mobile. It is the largest of the so-called OTT players to link its IDs to your mobile phone number. (Viber and others do this too, while Skype and Facebook use a separate address-space). I've actually been fairly scathing about the use of E164 (the international standard for both fixed and mobile phone numbers) by Internet and app players in the past, as it has tied users to a specific access provider, and not been easily extensible to PCs and tablets without SIM cards. But WhatsApp is a bit more subtle. While the app keys your identity to your originally-entered phone number, you can also access your "account" from another device with a different phone number. This means you can use WhatsApp on a second phone, when you buy a local SIM card on arrival in a new country (I do this a lot), or just SIM-swap on your primary phone if it's unlocked. What this means is that you can effectively do a basic form of mobile number portability "by the back door", even in countries where it's not mandated or has a complex/slow process for users to follow. You can get a new SIM or new phone contract - *with* a new number, but all your friends (if they use WhatsApp) don't need to change your contact details in their addressbook. In effect, WhatsApp decouples your E164 phone number from your access provider and turns it into an OTT ID. It does mean that you need to keep your old number "live" eg sending one SMS per month on a prepay PAYG account, though - presumably it all gets a bit messy if the number expires and gets re-allocated to someone else, although that could probably be worked out in the cloud by looking at your social graph. My sense is that this will drive continued growth and stickiness of WhatsApp in countries without MNP, or where it is cumbersome. It also means that every incidence of churn will likely further entrench its use. One other comment about WhatsApp - it (or its various competitors like LINE) is indispensable for people with friends living abroad. International SMS pricing is still, for the most part, ludicrously high and often opaque to end-users. It took me 5 minutes to find that my UK operators charges me 30p (c$0.50) for sending texts to non-UK numbers. There isn't even a price listed on the website for international MMS/picture messages. Obviously, I message my friends in Singapore or the US or Germany via another chat application or email instead, as I'm sure most other people do as well. It will be interesting to see how the still-minor telco RCS community handles this dilemma - it's pointless to discuss multi-operator interoperability, or RCS "hubs" or the IPX interconnect network, if it is driven by silly wholesale termination fees for messages. And yet I see little indication that there will be global, free RCS peering any time soon. And if users prefer WhatsApp to RCS some of the time (ie chatting to international friends) then they'll likely use it all of the time, especially if they churn as well. a) Standalone "classic" phone calls, or something very functionally-close to primary telephony. This is basic "Person A calls Person B for X minutes" (or goes to voicemail). Telephony is the bulk of "voice" today, to the extent that people often wrongly use the two terms interchangeably. VoLTE fits here as well. Traditional business PBX systems fit here too, mostly. b) Alternative forms of standalone voice communications that are not really "phone calls". Classically push-to-talk (walkie-talkie) service has been a good telco example, or conferencing - but there are also new types of realtime audio communication from the developer community. Encrypted secure calls with a dedicated app fit here. Some forms of enterprise mobile UC. One I heard about recently was "networked jamming" for band-members playing or singing in different places. Arguably Skype falls here rather than (a) as calls are often prefaced by an IM session and then "escalated" to voice - a very different user-interaction model than a normal interruptive phone call. Apple's Siri is also clearly a non-telephony voice application as well, albeit with one party as a robot. This domain is growing fairly fast. c) Embedded voice communications, in which speech/audio gets embedded into a website or application. This is where the action - and future disruption - is mostly going to come from. Well-known examples include voice-chat inside multi-player games, IM/voice hybrids (although these have gone out of fashion somewhat), call-me buttons in websites and a broad array of API- and WebRTC-based applications that are emerging, often with video as well. This model is likely to extend to mobile voice-enhanced applications in the near future - imagine a taxi app with a "speak to the driver" button, rather than sending an SMS with a phone number. In the enterprise space, "proper" collaboration via UC, plus concepts like Hypervoice mostly fit here as well. A similar split of use-cases applies to both messaging and video, for example with SMS and Apple iMessage being in equivalent category a), Whatsapp & LINE in b), and Facebook messaging originally as c) but now moving towards b) a bit as well. 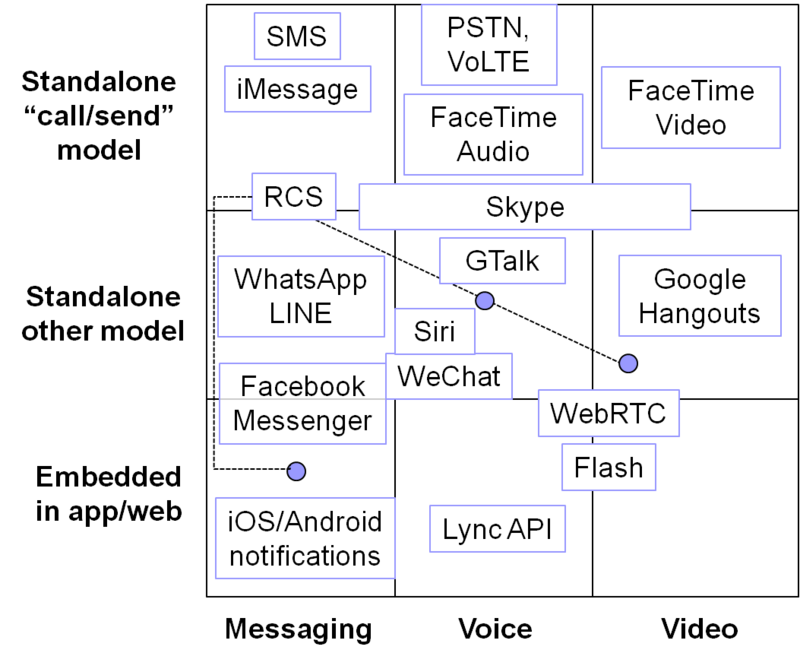 For video, Skype, Tango and Apple FaceTime are in a), assorted telepresence and CCTV apps in b), and most of the WebRTC and Flash-based video in c), especially in browsers but increasingly in apps as well. Notably, Apple has shown fairly little overt interest in category (c) to date - embedded communications to date. There are no easy iMessage or FaceTime Video APIs to incorporate them into apps, nor WebRTC support in Safari for websites. However, Apple has now finally joined the W3C's WebRTC working group, so perhaps we'll see some more concrete moves, as it realises that alternate 3rd-party approaches are putting the technology on iPhones, iPads & Macs anyway. Although it has gathered surprisingly little attention, Apple launched FaceTime Audio with iOS7 in September 2013. Despite the name being similar to the video product, it is specifically an audio-only voice calling product, that is very similar to a traditional phone call, with a similar UI/UX. It fits firmly into category a), although at present it is only available on LTE-enabled iPhones/iPads via cellular, or older devices like iPhone 4 via WiFi. At the moment, FaceTime audio is almost but not quite seamless. It has a separate icon to "ordinary" phone calls, and a separate ringtone. There also seems to be a bit of a lag from swiping the lock screen to audio actually starting, when answering a call. But it's quite close - because it is integrated into the main contact and dialler UI, it's even possible to use it by mistake instead of a normal phone call. I've had a couple of calls via FaceTime audio and been impressed by the clarity, and its good functioning over (probably fairly uncongested) LTE in central London. But it's not quite ready for primetime yet, given the relatively low numbers of both 4G users so far, and the patchy nature of LTE coverage in much of the world. In other words, it isn't quite as much an in-your-face slap to the telcos as iMessage was with SMS. It's also not usable with the sizeable base of iPhone 4/4S users unless they're on WiFi.As with iMessage, it only works between Apple users - otherwise it defaults to a normal circuit call (typically itself using CSFB, circuit-switched fallback). I suspect Apple is treating it as a large-scale beta at the moment, and monitoring both user behaviour and the app's performance in real-world conditions. What I do expect is that if FaceTime Audio gets favourable feedback over the next few months, it will be pushed higher in the stack towards becoming the default category-a telephony experience. That will be especially true for markets with decent LTE networks and sufficient iPhone user base to make FT-to-FT calls a decent probability. It may also be dependent on Apple indicating to users that it's consuming data allowance, and that niggling aspects of user experience like the lag in answering are fixed. As with VoLTE, it's also dependent on coverage, although Apple tends to make WiFi use easy on its devices. One possible scenario is that iPhones become FaceTime Audio-primary, with either VoLTE or CSFB as a fallback, either if coverage is poor or for iOS-to-non-iOS customers. The interesting thing there is it implies a double fallback - there always needs to be CS telephony if there's no LTE coverage. (Although I suspect Apple will be more willing and able to use decent HSPA for VoIP than the operators). One other interesting question is whether Apple might be able to improve/hack the radio aspects of all of this. The main problem with CSFB is the long call setup times - the network has to push the connection down from LTE to 2G/3G when the user makes a call, which takes some considerable time. Yet plausibly, Apple might be able to pre-empt this if the OS notices the user composing a phone number, or looking at the call register - perhaps only if there is no concurrent data traffic to disrupt. Similarly, if the user is already doing an intensive data task, maybe it might allow them to stop the phone shunting the connection down to 3G, just to receive an inbound call. It's wrong to imagine that all phone calls are more important than all data applications and should automatically have the right to override an ongoing 4G data session. In other words, Apple might try to reinvent and enhance category-a primary telephony, using a combination of FaceTime, CSFB, VoLTE etc, in order to make the experience of calling better. It could develop FaceTime Audio with "interruption controls" for the user, rejig the awful voicemail experience (remember the original Visual Voicemail?) and try to tune the device-based user-experience of telephony, which is something that GSMA, OMA and others have woefully failed to attempt. In many ways, iMessage is "like SMS, but better". I can imagine FaceTime Audio being positioned as "like voice calls, but better" in future too. (VoLTE is pretty much just PSTN-for-IP in terms of UI/UX, except where vendors try to blend it with video in a "communicator" product, or, laughably, couple it to RCS). In this way, Apple could be the company that stems the tide of (some) users from clunky-old telephony to categories b & c, especially "nearby" substitutes like Skype. To sum up, I expect Apple to monitor how FaceTime Audio works in practice, and then push it towards the primary telephony engine for iOS8 if it performs in way that's better for the end-user. CSFB will be the main fallback, although there is a slim chance of using VoLTE at the end of 2014. I could also possibly imagine an FT-A/IMS gateway and transcoder of some type. How will Apple play directly in "category B", the non-telephony standalone voice comms category? I suspect that Siri will remain the centrepiece here, using it as a gateway to various forms of cloud-based comms interaction. We already see Siri as assistant; I wouldn't be surprised to see it evolve towards concierge- or interpreter-type roles. As for WebRTC or other ways to category-c embedded voice and video, I think that Apple is probably acutely aware of its "unofficial" appearance on various of its devices already, despite no explicit support. WebRTC is being enabled either via browser plug-ins (yes, I know WebRTC isn't supposed to need them, but they're emerging anyway), or mobile SDKs from the likes of Tokbox, Twilio et al. I can't see these being blocked by Apple, despite Google's fingerprints all over WebRTC, because it is also supported by pretty much all telcos, all network vendors and most of the IT industry already. Moreover, early signs are that WebRTC will drive a lot of new user-satisfying applications, or enhancements of existing ones. I'd imagine Apple has take a close look at Amazon Mayday as a case-study, too. I don't think that Apple is able to create its own WebRTC competitor (perhaps unlike Microsoft), because it doesn't have the starting-point assets in productivity software, full-scale conferencing, UC, telco infrastructure, contact centres and the like. It could (indeed arguably should) release FaceTime audio/video APIs for native iOS app developers. But given that Apple has itself been the main culprit driving the dagger into Flash, it must also realise that the browser/PC use of embedded comms will only go WebRTC's way in future, especially give its still-small share of PC installed base, and the fact that Safari doesn't reach onto Windows devices. (In fact, I'd be surprised if more than 50% of Mac users still treat Safari as their primary browser, rather than Chrome or Firefox). Given its new membership of W3C WG, it wouldn't entirely surprise me if a future Apple iOS used WebRTC APIs or something very close to them, to give developers some way to embed FaceTime Audio and/or Video into apps. (It also wouldn't surprise me to see it acquire one of the cloud comms/SDK players too). There are some open questions over codecs (Apple likes H.264 for video, but has been silent about the "done deal" of Opus and G711 for audio) but I don't see that as a showstopper. I also suspect Apple is slightly worried what might happen when Google (inevitably in my view) puts WebRTC APIs right into Android, meaning that developers could not develop feature-equivalent iOS apps without relying on 3rd party APIs. Before I started focusing more on mobile, I used to spend more time as an enterprise comms and networking analyst. WebRTC and my Future of Voice research has taken me back into that sphere more deeply in recent years. Clearly, Apple has been making a more concerted effort in the enterprise recently, with a dedicated developer programme, and rather more overt marketing and positioning of iOS for business/government users. It is no doubt aware that many large companies are moving to iPhones, as well as iOS devices being likely a popular choice for BYOD programmes. iPads are also gaining strong adoption across the business landscape, for diverse use-cases. However, as yet Apple has shied away from anything resembling a full UC strategy, instead leaving that space for its developers to exploit. But if FaceTime Audio and Video become more-used by employees, might that change? In particular, there may be issues around call-recording that emerge in some sectors like finance. There is also a B2C angle here, especially where iPhone users interact with a business that also uses Apple devices - Microsoft appears to be grooming Skype & Lync as a way to enable direct connection from customer to business without a 1-800 or similar mechanism. I don't really see Apple wanting to compete head-on with Cisco or Microsoft or Avaya or BroadSoft and peers in this area. Apart from anything else, the hardware margins aren't there. But I can certainly imagine an attempt to blend or gateway FaceTime (and maybe Siri for cloud voice like recording) with select partners. Unlikely to happen too quickly though - but I'm keeping a close eye. Overall, I think the next 12 months will yield much greater clarity on Apple's stance on voice communications, as well as video or messaging. I wouldn't be surprised to see WebRTC (or almost-WebRTC) emerge as an important part of the overall experience, but I think FaceTime Audio is the bit which will suddenly be noticed by customers. VoLTE - if and when Apple implements it in late 2014 or more likely 2015 - will probably be pushed down to a supporting role, when neither FaceTime nor embedded communications is appropriate, similar to SMS's secondary role to iMessage and push notifications today. Siri might be pressed into broader service as a general gateway to "cloud voice" functions, while enterprise UC will still probably not be tackled directly by Apple on a standalone basis - although elements like conferencing might be carved off to compete more with Google. ... is that there are at least 10 completely separate problems for VoLTE. I've long said that VoLTE is a good idea in principle (ie having a standardised "plain vanilla" carrier telephony service for wireless IP networks). Over six years ago, I predicted this was necessary, but would face many practical difficulties, so getting started ASAP was important, even on old HSPA networks before LTE. It took years before fixed VoIP worked well. It was invented around 1997, but it was a least 7 years later that it even started to be reliable on enterprise Gigabit Ethernet LANs, where the CIO was free to use whatever equipment and QoS tools were needed. The first carrier broadband VoIP was launched by Softbank Yahoo in Japan in 2002. Twelve years later, we're still at less than 30% replacement of global circuit PSTN today. The idea that adding not just cellular and mobility, but a completely new radio, RAN & EPC architecture to the mix would make 4G VoIP any quicker to launch/deploy/adopt is wishful thinking of the highest order. I keep getting pitched by vendors with solutions to bits of the VoLTE puzzle I hadn't even realised existed. Yesterday was the turn of Stoke, talking about latency inside routers and gateways from packets having multiple hops between functional blades doing DPI, encryption, routing and so on. Apparently the impact on small packets (step forward, voice calls) is particularly bad. I'm not a router-architecture specialist, but it sounds plausible. Apparently it's also a problem that will get worse as NSA-inspired paranoia inspires telcos to put harder crypto in various bits of their IMS/voice networks in future. 2048bit-wrangling won't be quick or easy, especially if it needs to be done sequentially with all the other functions in the chassis. I'm just adding that to the ever-growing list of serious obstacles that VoLTE faces in actually getting to widespread launch and adoption. Oh, and if fixed-VoIP is anything to go by, we'll probably be dealing with a host of new & exciting acoustic failure modes that require a black-belt network & device media-engine ninja to diagnose. Most of these issues are completely orthogonal to each other - and are being fixed by vendors who are probably mutually unaware of the existence of each other, or each other's problems. The likelihood of inter-dependence is probably high. All the fun new stuff coming down the 4G/5G pipeline like coordinated multi-point networks, small cell overlays, carrier aggregation & so forth probably won't help either. Meanwhile, in most advanced markets there is now flat or declining demand for vanilla telephony (& revenues/profit associated with it), even in perfectly-working GSM guise. Except where previous high prices & elasticity means a bit of latent demand still lurking, usage minutes are going to fall in future. And no, so-called "HD" voice won't make a blind bit of difference - it's available for 3G already, if it mattered that much ,and it doesn't. In other words, VoLTE is now very late, with new problems emerging all the time, which are likely to be ever more expensive to fix. It's serving a declining market for a 120-year old product that consumers are starting to desert and dislike. It's based on a clunky, expensive and complex application platform (IMS) which isn't fit for the 21st century's communications trends. And all the old networks & CS systems will need to be kept in place for at least a decade (maybe two) in most countries, adding to the overall OPEX. And in other news, I've had inbound calls on both FaceTime Audio and Skype on my LTE iPhone in the last couple of days. Both needed a couple of seconds juggling with the UI to unlock the screen & answer the call, but seemed to work fine (with HD & optional video, obviously) once they got going. And I'm not even going to mention WebRTC's inevitable rise over the next couple of years. I'm sure we'll hear lots about VoLTE in Barcelona. But as of yesterday there were 268 LTE networks operating in 100 countries (source: GSA), yet I count only 4 "proper" VoLTE (3 Korean telcos + MetroPCS) launches and a couple of press-release face-savers. That's a big enough red flag. So, how many more "big problems" still need to be fixed for VoLTE? That's the problem. We don't know. And worse, most of the problem-solvers don't even know each other. I wouldn't want to be a vendor dependent on this space, as you're relying on many many other peoples' ingenuity rather than your own. I'd be investigating alternative sources of business too. I'm currently doing a fair amount of work looking at next-generation fixed and mobile data tariffs and business models. One of the concepts I still see expounded is the idea of "sender-pays" models, where a third party (typically a content or application company) pays for a consumer's data usage for a given website or app. Usually, this is given equivalence to either 1-800 phone numbers, or maybe the original model for the postal service, where the sender (generally) pays for the postage for a product, rather than the recipient. Occasionally, people talk about the Amazon Kindle or some other dedicated hardware such as smart-meters or in-vehicle telematics, where the network provision is vertically-integrated into the offer. This has recently come to the fore with AT&T's suggested "sponsored data" model, which I believe will fail. It is also a recurrent theme among certain lobbying and industry groups, which keep trying to come up with ways for Internet access to be paid for "twice", usually with spurious references to "sustainability". With very few exceptions, there are multiple "senders" in any given Internet interaction. Most obviously, there is upstream traffic as well as downstream. Who is responsible for the upstream? No content/app companies would want to have 800 different "sender-pays" arrangements with every network operator, and possibly multipliers of that given each has many different plans. No content/app company is going to want to pay extra sponsor data where users have more-than-enough in their monthly/PAYG quota. Poor fit with adapative-rate codecs & other solutions, which will vary the amount of data depending on network conditions and therefore make predictions of volume/cost impossible. There are many other pitfalls, erroneous assumptions and outright fallacies here. There is also a huge moral hazard around transparency, neutrality and potential damage to the wider Internet model which is a multi-trillion dollar benefit to the global economy and democracy. While AT&T has been very careful to stay on the right side of Net Neutrality for now, it is entirely possible that other operators will be consumer-unfriendly or simply fail to think through the ramifications. The bottom line is that the sender/recipient model is not the way the Internet works. It is fine as a piece of rhetoric to talk about sponsored / 1-800 / third-party pays models for data services (especially outside Public Internet Access), but it must be remembered that a lot of the metaphors employed are archaic and do not translate to the reality of HTML or application design. In particular, the use of 3rd-party WiFi puts a coach & horses (deliberate 19th Century reference!) through most of these type of models, as it gives both users and content/app companies a great incentive to arbitrage away even the current use of quota-driven broadband. I've also seen sponsored WiFi from app companies ("Free WiFi if you use Office 365"), which is likely to be better-value & better-publicity for Internet firms.